Not too long ago, my wife and I were driving home from church. If you’re in Student Ministry, you know how it goes… because we didn’t have to be at church at the same time, we were driving home in separate cars, talking to each other on the phone. She asked me, “Why do you have those students running games?” and my answer wasn’t very well thought out. …Well, they’re available to do it. …I had to do the baptism in big church. Which got me to thinking… Games are more important than we often give them credit for, so how can I set-up the hosts to win? And, if Camp is the most important event of our summer, those games need to be next-level. How can I ramp up our summer camp game hosting skills? The crowd will never out-pace the energy of the host. So it up to you—up-front stage presence to set the tone for that piece of the program and encourage the crowd to follow your lead! Think about it. Have you ever been to a graduation or school assembly where the speaker took his time getting up, fixed the microphone, cleared his throat, took out his notes and then started talking? That long-pause can feel never-ending to the audience! And that’s not going to work at summer camp! You don’t have to be phony, just be excited… which I’m sure you already are. 2) ALWAYS HAVE SOMETHING AT STAKE. This is, perhaps, my favorite item on this list. At the summer camp that I am the founder and director of, we break the students into teams and then compete with one another throughout the week. We’ve found that putting Team Points on the line really ups the ante when it comes to student participation. The winning team usually gets a free t-shirt or to be first in line at dinner on the last night, but if there are points to be earned or lost, students will do anything—even crazy, ridiculous things—to make sure their team stays in the running for that number one spot. When it comes to games, make sure there’s something at stake! A prize to be won or reward to be lost…some incredible or terrible consequence that makes students want to participate! PRO-TIP: If you have a team of apathetic, freshman boys who want to earn zero points because they think they’re too cool to participate, then award them points for simply being in the room, and their plan backfires. Win-win! 3) HAVE CHEMISTRY WITH YOUR CO-HOST. And host with someone you have chemistry. Don’t feel the pressure to create 100% of your programming from scratch! Lean into the great resources that are out there. Half the battle is running the game with energy and excitement, so let the brilliance of youth workers from around the country do the other half (the content) for you! If you’re running stage games, the absolute best way I’ve ever found to select your contestants is using Pick Me (People Picker) in the DYM Games App. If you are keeping a running tally of points, use the Scoreboard builder to show who’s in the lead. Poser is always a great way to warm up the crowd. You can also use some of the hundreds of games that are in the DYM Store. One game that I always turn to as a “back-pocket” game, is Bring Me! Get it for FREE in the DYM Store this week! PRO TIP: I found this out the hard way, but if you have your student’s name in an excel spreadsheet, simply copy and paste an entire row into People Picker and Voila! You’re done! You don’t have to painstakingly and manually enter each individual name. And finally, nothing can derail you faster than being unprepared. Give more thought to the game than just the 10 seconds as you’re walking up on stage. ** BONUS TIP ** LEVEL THE PLAYING FIELD. This tip requires you to be quick on your feet… so approach with caution! As a game is being played, if you can tell one contestant or team is running away with it (the score is 7-0 with two questions to go), try your best to shift things to a point where it will be decided at the last second or on the last question. You’re trying to avoid the entire audience knowing the outcome of the game and losing interest. You’re also trying to keep the underdogs from giving up too soon. One common tactic is to make a question worth 2 (or 10 or 100! ), immediately bringing a team back to the equal playing field, if they answer correctly. If you’re playing boys vs. girls dodgeball, make the boys play on their knees and throw with their left hand. Or add 5 or 6 leaders to the girl’s side. You can also try flipping the rules at the last minute! We were playing Poser at our Winter Retreat, and to even the playing field, we switched things up. Instead of being eliminated for matching the screen, the last few rounds eliminated those who were not matching it. 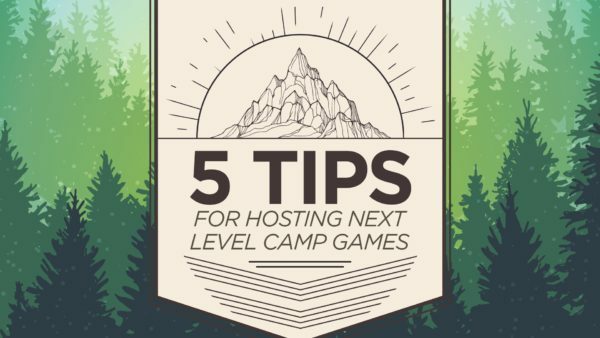 I hope these tips help to make your camp games even more epic! I’d love to see pictures and hear stories from your summer programming. You can find me on Twitter @nickclason or Instagram: @clasonnick. Looking for more ideas on how to create a camp culture? Check out my most recent e-book on DYM! P.S. Speaking of games…we just released the sequel to the BEST-SELLING DYM GAME OF ALL TIME: Dead Cat 2! If you haven’t seen it yet, check it out! We also released 18 more NEW resources. Check them out HERE.